The Citroën XM Pallas Braves Earthquakes, Wild Horses, Raging Lava Torrents! 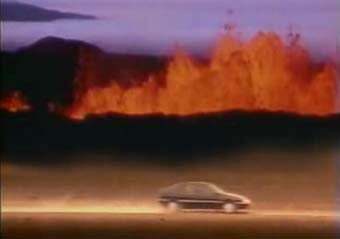 The best ads tell a story, and this one for the mid-90s Citroën XM Pallas certainly does that. In fact, it's more of an informercial than an regular car ad, with inspiring music right out of an Early Dot-Com Era shareholder's meeting. Best as we can tell, the Citroën driver here is bringing a box containing a critical mass of our favorite off-brand fissionable material, Uranium 233 (cast in a ring shape, of course, to avoid troublesome criticality events in the back seat) to the local warlord's headquarters in a Damnation Alley-esque post-disaster world.